A new place that specialises in all kinds of falafals and pita bread? We are sold. And Habibi Falafal in Koramangala is bringing rolls, sandwiches and pita pockets, all with falafals in it. Vegetarians, you are going to love this place because of so many choices available to you. The space is done up in clean minimal lines with communal tables for eating your Middle Eastern meal. You can go and order up your food at the counter and pick from several kinds of toppings such as salads, pickles and fried vegetables too. 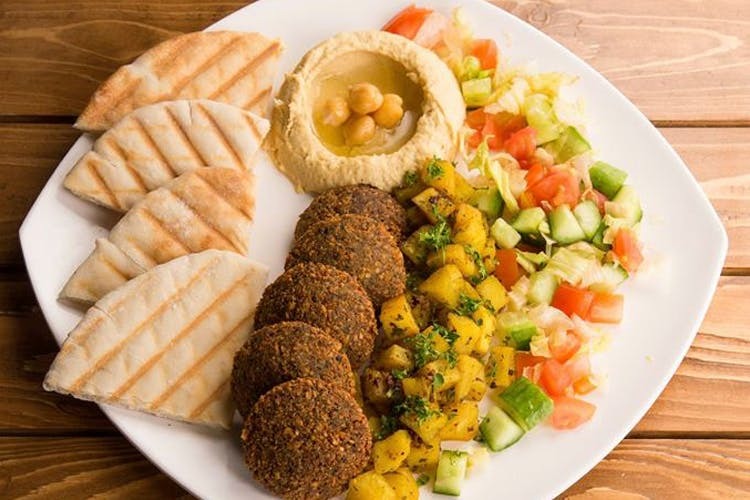 There’s traditional Falafal rolls with hummus and tomato tahini and salads, and an Unlimited version with fried vegetables, salads and pickles. There’s also the Arabic Samoon sandwich with similar fillings, pita pockets and a burger too with a falafal patty topped with an eggplant muttabal sauce on a freshly baked sesame seed bun. They also do falafal and hummus by the platter and salads too. From the quick bites section, the Potato Harra — cubes of potato mixed with spices, chilli and herbs is a good choice. End your meal here with baklava or try one fo their freshly squeezed juices — pomegranate, orange, grape and lime. And the best part? Everything is priced under INR 110.